Scale Plans No. 40 Mitsubishi J2M Raiden "Jack"
Esci-Ertl 1/48th Scale Lockheed Vega "Winnie Mae"
Tamiya 1/48th Scale Japanese Mitsubishi J2M3 "Raiden" Allied code name "Jack"
Monogram 1/48th Scale U.S. North American AT-6 "Texan"
Otaki 1/48th Scale U.S. Curtiss P-40E "Warhawk"
Scale Craft/Esci 1/48th Scale German Fiesler Fi-156C "Storch" or "Grasshopper"
Nichimo 1/48th Scale Japanese Army Type 99 Assault (Reconnaissance) Plane Mitsubishi Ki-51 "Sonia"
Platz 1/72nd Scale German Heinkel He-219 A-7 (A2/5/7) "UHU"
Otaki 1/48th Scale U.S. Grumman F6F-3 "Hellcat"
Hawk 1/48th Scale British Westland Mk. II "Lysander"
Monogram 1/48th Scale U.S. Martin B-26 "Marauder"
DML Dragon 1/48th Scale German Messerschmitt Me-163B-1a "Komet"
TB 1/72nd Scale Curtiss P-40M "Kittyhawk III"
Platz/Eduard 1/72nd Scale Mig-15UTI- Two-seated Jet Trainer "Soviet Air Force"
Revell 1/32nd Scale Japanese Kawasaki Ki-61 "Hien" Allied Code Name "Tony"
AMT 1/48th Scale British Gloster Meteor Mk. 1 with German V-1 "Buzz Bomb"
Monogram 1/48th Scale U.S. Northrop P-61 "Black Widow"
Platz/Zvezda 1/72nd Scale Soviet Su-27SM2/3 "Flanker B, Updated"
Platz/F-toys Confect 1/144th Scale Lightning F.6 "Royal Air Force"
Platz/Eduard 1/72nd Scale Mig-15UTI- Two-seated Jet Trainer "Finnish Air Force"
Smer 1/48th Scale Nieuport 11 "Bebe"
Airfix/Craftmaster 1/72nd Scale Bristol Beaufighter T.F.X. Revell 1/72nd Scale Avro Lancaster Mk. I "Dam Buster"
Revell of Germany's 1/72nd Scale Horten IX/GO 229 "Flying Wing"
Testors - Italeri 1/72nd Scale German Heinkel He-111Z-1 "Zwilling"
Italeri 1/72nd Scale Italian SM-79 "Sparviero"
PM Model 1/72nd Scale German Focke Wulf Ta-183 "Huckebein"
Revell 1/32nd Scale Japanese Kawasaki Ki-61 Hein "Tony"
DML DRAGON'S 1/35th Scale German Sd.Kfz. 184 "ELEFANT"
RPM 1/35th Scale French Lorraine 37L (f) "Schlepper"
Build Review of Tamiya 1/35th Scale KV-II "Gigant"
Tamiya 1/35th Scale KV-II Russian Heavy Tank "Gigant"
Alan 1/35th Scale Soviet SU-76M S.P.G. Tamiya 1/35th Scale British Infantry Tank Mk. II "Matilda"
Tamiya 1/35th Scale Japanese Medium Tank Type 97 "Chi-Ha"
Italaerei 1/35th Scale Jagdpanzer 38(t) "Hetzer"
Tom 1/35th Scale German 88mm Raketnwerfer 43 "Puppchen"
DML Dragon 1/35th Scale German Prototypical Flakpanzer V "Coelian"
Bandai 1/30th Scale German Pz.Kpw. IV "Heuschrecke -10" or "Grasshopper -10"
Monogram 1/32nd Scale U.S. Sherman M4A1 With Rocket Launcher "Screamin' Mimi"
Tamiya 1/35th Scale German Flakpanzer IV "Wirbelwind"
Mirage 1/35th Scale Renault UE Tracteur, sWg. R.40/28 cm Wk Spr. CMK 1/35th Scale German Flakpanzer IV/3.7cm Flak "Mobelwagen"
Tamiya 1/35th Scale British 25 Pdr. Field Gun & Quad Gun Tractor Canadian Ford F.G.T. Lindberg 1/32nd Scale Landing Craft Vehicle Personnel L.C.V.P. Hasegawa-Bego Version 1/35th Scale German Kubelwagen Type 82 "DAK"
Revell of Germany Tiger I - converted to "Early"
Dragon Dragon SS-1c "Scud B"
Tamiya Tiger I "Battle of Kursk"
AFV Club "Duece and a Half"
Tamiya Pz III Ausf N.
DML M4A2 (76) "Red Army"
Tamiya British Light Utility Car "Tilly"
One of the deadliest weapons in the skies today is the attack helicopter, the most formidable of these being the Soviet Mil Mi-24 Hind. This weapon is seen in two major variations, the hind A, with a angular cockpit greenhouse, and the Hind D, with the unique double-bubble arrangement for the two pilots. Both versions are equipped to carry up to eight fully armed troops plus heavy loads of weapons and support equipment, a characteristic unique to the Hind. The Hind-D version, depicted by this Monogram model, is specifically designed for the ground attack role, and carries a nose-mounted 12.7mm four barrel rotary cannon. Additional guns can be mounted on the stubby wings, along with a variety of the ground attack missiles and bombs. Two of these helicopters were delivered to the West by defectors in 1986. Production of this deadly machine began over thirty years ago and several hundred have been exported to countries outside the Warsaw Pact. Most notable have been the Hinds used by the Soviet-backed government in Afghanistan and those with the Sandinistas in Nicaragua, about 300 miles south of Mexico. This Monogram kit of the Hind-D comes with markings for these helicopters used in Afghanistan, Czechoslovakia, Nicaragua and by the Soviet Union. This kit is by Monogram, who is now owned by Revell. Although this particular boxing is out of production, (it has a copyright date of 1986) a Hind has been released in this scale under the Revell banner as kit no. RMX5856. 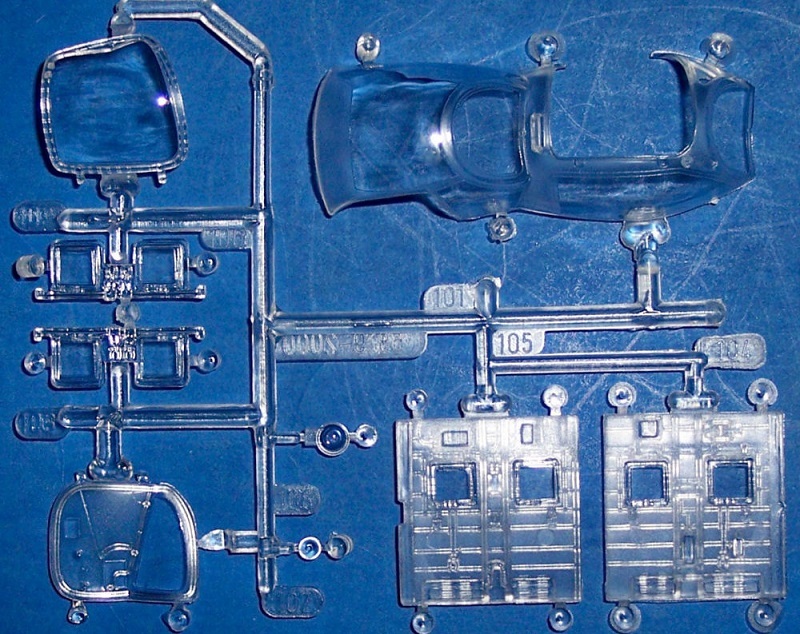 It may be a re-pop of this Monogram mould with new decals and boxart. The kit comes in a shrink-wrapped tray and lid type box. 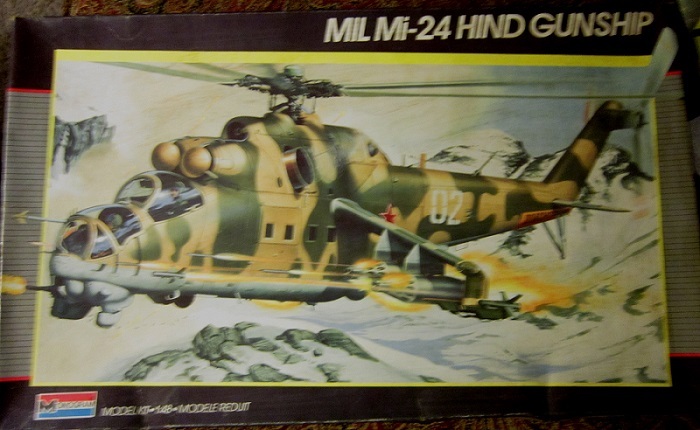 The box art shows a Hind-D overflying snow covered mountains and firing it’s under-chin gun and rockets. It is in Soviet Air Force markings with a fuselage number of white 02. However, on the decal sheet this number is printed in yellow. It has a camouflage pattern of dark green over tan above and light blue below. Under the tail is a yellow banner with the Russian word for CAUTION on it. 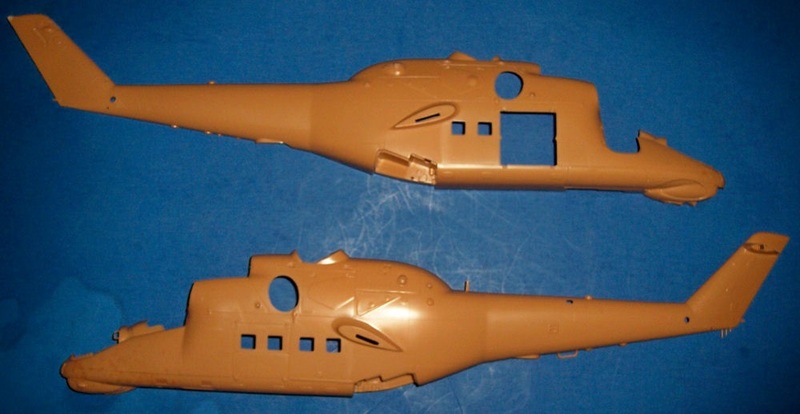 Inside the box are 3 light tan trees of parts, the two light tan fuselage halves, a tree of clear parts, the decal sheet and the instructions. Parts trees are all in one large sealed cello bag. The trees are numbered, next to each part, but they are not alphabetized. This means searching each tree for the part needed in each construction step. Bad move Monogram. 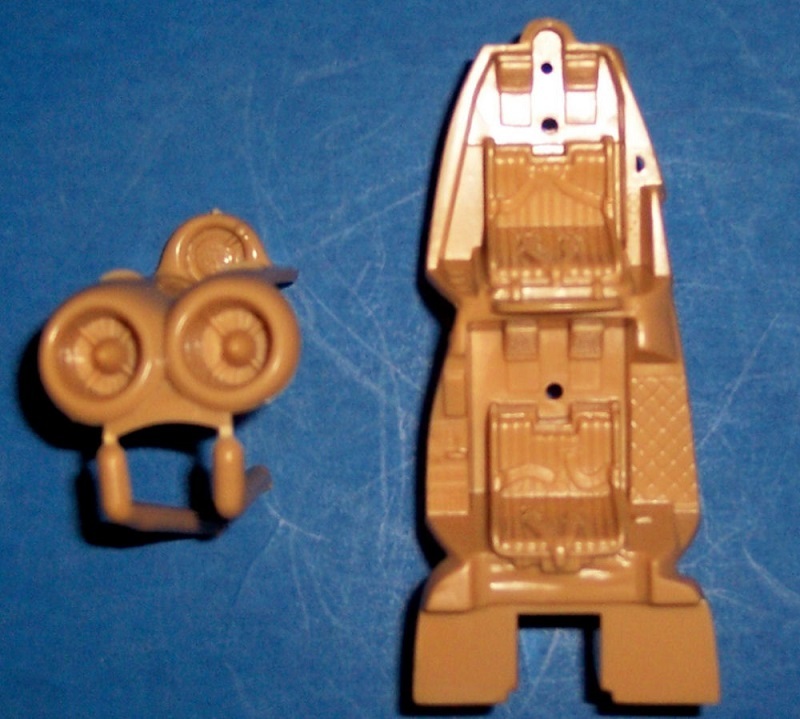 The last tan parts are the two fuselage halves. The instructions consist of a very large sheet (21 ½” x 16 ½”) that is folded in half horizontally and then folded vertically into 4 sections. Page one has a line drawing of the Hind at the top, followed by the history of the helicopter next to international assembly symbol explanations. Page two has READ BEFORE YOU BEGIN instructions in 7 languages (including English) followed by a paint color listing for Monogram-Humbrol brand paints. The rest of his multiple folded sheet has a total of no less than 47 assembly step illustrations. These are very detailed and include color mentions for any item needing painting in each step. Nice! At the end of the assembly steps is a 3 view illustration of the Hind showing it’s segmented camouflage. Next to that is a listing of the colors that were used on each of the 4 schemes available on the decal sheet. 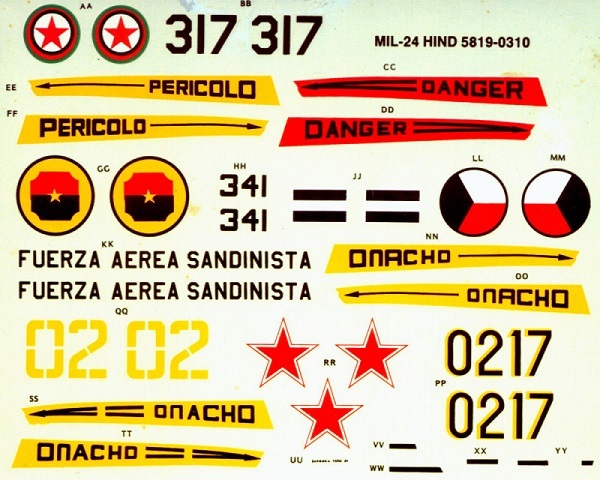 This is followed by four 2-views of each of the 4 schemes provided in the kit, showing decal placement. The decal sheet could, perhaps, have included some stencil markings. I bought this kit back in the 80’s at my local hobby shop. Previous to it there was only one lonely 1/72nd scale kit of the Hind available, I think by Airfix.